It started in Greek with the meanings: "to do, act, perform"; then it meant "civil business, deed, act"; and into Latin as, "skilled in business or law". The meaning concerned with "practical results or values" is first recorded in the form pragmatical (1597) and later as pragmatic in 1853. The form, "pragmatism", is a philosophy that stresses practical results. Loss of the memory of the appearance of objects. 1. 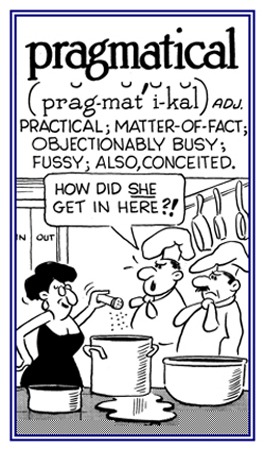 Concerning the theory of pragmatism. 2. More concerned with practical results than with theories and principles. 3. Guided by practical experience and observation rather than theory. 4. A reference to a practical point of view or to practical considerations. 1. Pertaining to the issues of practical matters: Hank was known to be a very efficient and pragmatical person who helped solve the problems and needs that the older people had in the retirement home. 2. Etymology: from Greek pragmatikos, "active"; from Latin pragmaticus, "relating to being busy". © ALL rights are reserved. 1. In a realistic manner. 2. In a pragmatic way: "My teacher said that these linguistic guidelines should be applied flexibly and pragmatically." The quality or state of being pragmatical. 1. The branch of linguistics that studies language use rather than language structure. 2. The branch of semiotics that deals with the relationship between signs, especially words and other elements of language, and their users. 1. In philosophy, the doctrine that practical consequences are the criteria of knowledge and meaning and value. 2. The attribute of accepting the facts of life and favoring practicality and literal truth. 3. A straightforward practical way of thinking about things or dealing with problems, concerned with results rather than with theories and principles. 4. A practical, matter-of-fact way of approaching or assessing situations or of solving problems. 5. A theory concerning the meaning of words originated by the American philosopher C. S. Pierce. The term and basic idea was borrowed and developed by William James and John Dewey (1859-1952) to create a thoroughly Modern American Philosophy based on a theory which identified truth with the notion that whatever works is true. 1. A person who takes a practical approach to problems and is concerned primarily with the success or failure of his or her actions. 2. A person who is oriented toward the success or failure of a particular line of action, thought, etc. ; a practical person.